Winter container gardening is possible in many gardening zones if you choose cold hardy plants. Such plants are able to withstand most winters, although deep frosts, prolonged cold below 20 degrees Fahrenheit, and heavy snowfall will kill them. Although many people think of container gardening as a spring and summer activity, you can extend the container gardening season by choosing plants able to withstand winter conditions in your area. Gardening zones 7 through 10 provide winter conditions more suitable for container gardening than zones 3 through 6, but nearly every gardening zone offers some possibilities. It's important to choose containers for winter container gardening wisely. The best containers for winter container gardening are heavy-duty plastic containers. If you already have large stone urns or other decorative stone planters in the garden that are too heavy to move each year, you can use them, but you may be better off covering them with a tarp and choosing something else. Cement planters often crack when water finds its way into tiny crevices in the cement, freezes and thaws. Similarly, terra cotta should not be used for winter containers. Its porous surface easily cracks when ice crystals form. Decorative glazed ceramic should also be kept indoors. Heavy-duty plastic tubs or heavy resin containers may be the best choice for winter gardening fun. Use fresh gardening soil and add rocks or pebbles to the bottom to ensure proper drainage. Place big containers in the location where you want them before you fill them with soil as they may be too heavy to move once filled. Choose plants that not only look beautiful during the winter but will withstand the cold and snow. Many shrubs lend themselves to winter containers. A tall, narrow holly adds beauty to the landscape by its rich, glossy green or variegated foliage and red berries on female plants. Junipers also have beautiful gray-green foliage and some have rich purple-blue berries, another source of color in an otherwise drab landscape. Nearly all types of evergreen shrubs look wonderful in winter pots. Be sure to choose plants suitable for container gardening. Ask at the garden center or learn more about dwarf varieties suitable for containers. Certain fall annuals also make great container garden plants. 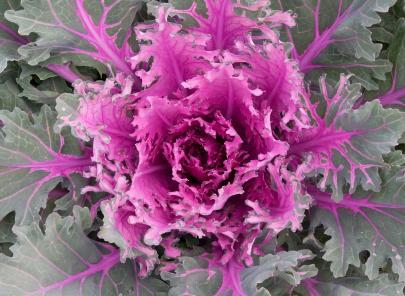 Ornamental cabbage and kale provide green, purple, bronze or ruby foliage with ruffled or smooth edges. Many gardeners love planting these pretty vegetables in containers. When snow and ice gather on the edges they often form beautiful patterns, and it takes a really brutal cold snap or heavy snow to damage them. Pansies can survive in mild winters where daytime temperatures rise above 40 degrees or so. Just be sure to cover them with plastic, newspaper or mulch if snow is in the forecast. Remove after the snowfall to allow light and air to circulate. Even if pansies appear frost-damaged, they can often recover, so you may want to leave them in the container even if they seem brown. They may surprise you. Plants need less water during the winter than during the summer. If the container is in an open area where natural rainfall can water it, you may want to let nature take care of any necessary watering. Otherwise keep a watering can inside the house and water sparingly. Don't leave watering cans outside if temperatures drop below freezing. Like pots, watering cans can crack if the water inside freezes and thaws.